Natural latex comes in different firmness levels. ILD or density is the way we measure how firm or soft a piece of natural latex is. We have many customers ask about ILD, here is a bit more information. Indentation Load Deflection (ILD) is a test that was standardized in Great Britain for testing the firmness or hardness of polymer materials. ILD is measured by indenting (or compressing) a foam sample to 25 percent of its original height. The amount of force (in pounds) required to indent the foam is its 25 percent ILD measurement. The more force required, the firmer the foam. The ILD range that is commonly seen in natural latex for mattresses is about 20 ILD (very soft) – 45 ILD (very firm). Another way to measure natural latex is density. Density is a measurement of the mass per unit volume expressed as kilograms/cubic meters. Density in natural latex for mattresses usually varies from around 60 kg/m3 to about 95 kg/m3. Both ILD and Density are ways of measuring the firmness of natural latex. The greater the ILD and the greater the density, the firmer the natural latex will be. When shopping for mattresses, keep in mind that even if two different mattresses have the same ILD, the feel of the overall mattress will probably differ. 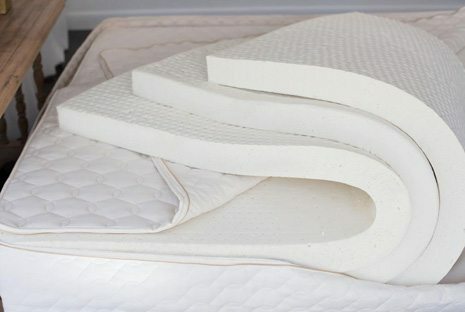 How firm or soft the natural latex foam is will certainly contribute to how your mattress feels, but it is not the only factor. Other factors that contribute to the overall feel of the mattress include differences in organic cotton textiles that are used for the mattress encasement, how tight the encasement is, and the amount of wool used. If the cotton ticking is flexible, like a knit fabric or similar, the mattress will likely feel softer than if the mattress ticking is taut. Similarly, if the mattress encasement is tight, the mattress will feel firmer than if the encasement is slightly looser. Last, if more wool is used in the top of the mattress, it can tend to make the mattress feel softer than if less wool is used.